Home » Family Fitness » Family Life » Play Field or Parking Lot? I will do my best to make the meeting tomorrow night regarding traffic congestion at John Muir School. However, in the event that I cannot, I thought that I would write to you as well. My name is A---- and my daughter is a Kindergartner at John Muir School. We live about 0.5 miles downhill from the school and every day we either bike A---- (using a tandem bike) or walk with her to school. These 10 minutes of time with A---- count as the favorite part of our day. Not only are we all getting exercise, but we have great conversations during our bikes/walks and we all have really enjoyed this experience. Everyday fellow students and their parents drive past us us as we walk or bike, saying hello and commenting on how fun what we are doing looks. Seeing A---- bike with her dad to school has even inspired another kindergartner to start riding a tandem bike to school with her dad too. You have never seen bigger or more proud smiles on two little girls faces as when they bike up to school with their daddies. I tell you all this to point out that I think suggestions to remove the beautiful open space green at John Muir school and turn it into a parking lot as a way to reduce traffic congestion are missing the point on so many fronts. (1) We should be encouraging people to get out of their cars, not make it a priority for them to stay in their cars. We should be encouraging people to walk with their kids to school, rather than drive them. I would hazard that most people are driving their kids less than a mile to school and are spending what could be quality time with their kids sitting in traffic and being frustrated. An easy alternative would be for them to walk all (or some) of the distance through the lovely neighborhoods that surround the school. Honestly, even if people parked 0.25 -0.5 miles away and walked, it would take them less time, be more enjoyable, and get everyone some badly needed additional exercise. This messaging should be the focus of our discussions if we are really serious about creating a sustainable and healthy student and family population. (2) We should better prioritize how we spend the school district's limited funds. As a parent of a child in an over-crowded, under-funded kindergarten classroom, I am SHOCKED that the District would consider spending money on a parking lot before it has taken action to reduce class sizes, add teacher's aides, and otherwise improve the quality of the education being offered. The priority of the district should first be to the children, not to disgruntled neighbors (who knew they were buying a house near a school) or to the parents who haven't been encouraged to consider alternative modes of transportation (i.e., walking) or offered more flexible drop off times (i.e., by allowing kids to be dropped off a little earlier than 8:10 AM, you could mitigate some traffic issues). 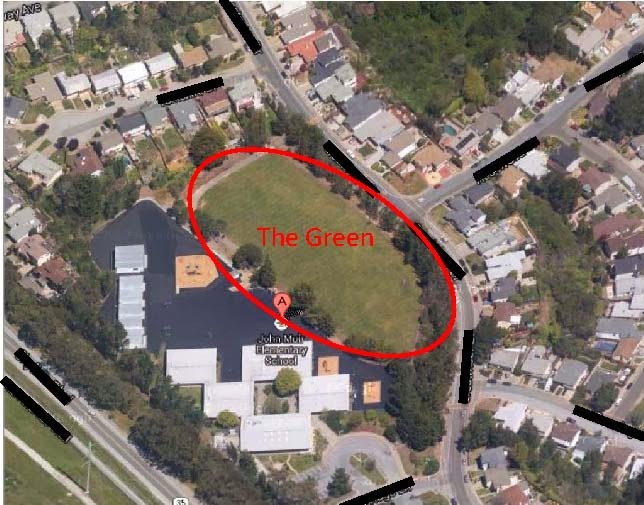 (3) By turning the green into a parking lot we would be losing a valuable community and school asset: open space. One of the most wonderful things about John Muir School is the beautiful, open space green on the lower field. To destroy that in order to put in a parking lot would seem to be a major loss to the school and the community, and to a commitment to allow our kids to live healthy lives and to explore open spaces. We have already carved up and destroyed so many beautiful open spaces, it would be a real shame to lose yet another in an attempt to avoid 10 minutes of traffic congestion, 180 days a year. I hope that you do seriously consider the points I have made above. I really feel that our energy could be better directed towards improving the education and learning of our kids, of getting EVERYONE out of their cars and exercising more, and celebrating our open spaces, rather than desecrating them. I think it is important to the integrity of the school name (John Muir) to consider the big picture when making this decision. This is AMAZING. Can't wait to hear what response you get. So true and so heartfelt. Go you! Thanks for the support! Your trip looked amazing!